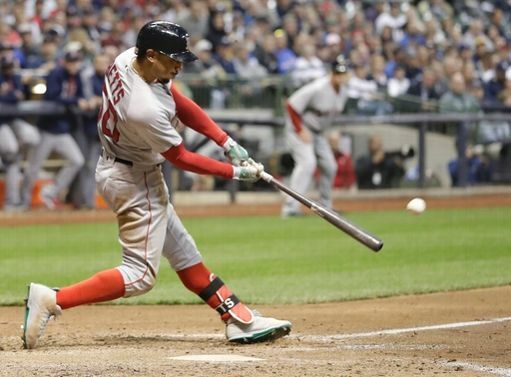 Mookie Betts went 4 for 4, including a homer and double; and he drove in four runs. He was on base five times. Average is back over .300, and he the home run was his fourth of the season. But the Red Sox still fell 11-7 in Milwaukee on Tuesday night. Freddie Freeman remarked just a few days ago that Miller Park was ‘poorly lit, like a little league field’. It seemed as though it was well lit for the hitters on this night as Drew Pomeranz and Wily Peralta were set fire to to the tune of 18 runs and 25 hits. That monster Eric Thames hit his 13th home run of the season. He’s back on track after a short hiatus. Keon Broxton had a huge night. The Brewers just kind of had the ball last so to speak in this shootout. The Red Sox aren’t particularly great right now. But we like them and we’ll continue to write about them often this year. Especially that Betts kid. He’s exceptional.